Last birthday celebrated on the boat, last month traveling below the Tropic of Cancer; we’ve started clocking expenses for our return to land, although you’ll not find them here. Yeah, we’ve been slackin’ it in the marinas. Palmira isn’t the cheapest. Ice cream is almost keeping pace with booze. Almost. 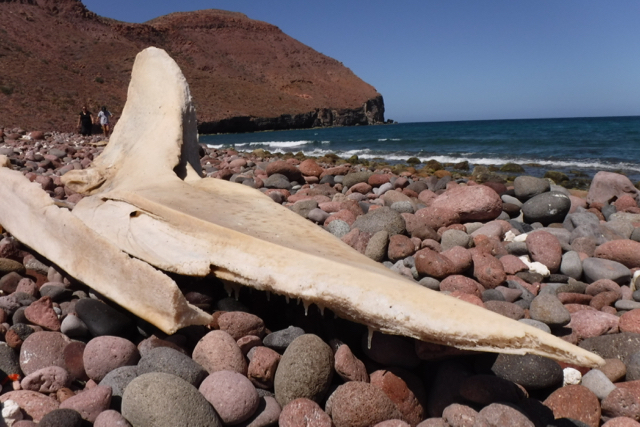 “Education” here encompasses a visit to the whale museum, a book, and our travel permits for Espiritu Santo. Why yes, we have been paying a lot for water. Still cheaper than a watermaker, though, and a lot easier to maintain. We did a lot of laundry at our friends’ rental. Marina Palmira also has pretty nice coin-op laundry facilities, which we haven’t seen since Port Antonio, Jamaica. “Communications” kind of blew up this month, right? We’ve still found it important to maintain our sat phone; we’ve been in places in Baja with no cell service, and have been pretty happy to get the weather (even though it hasn’t always been exactly spot-on). A bigger expense, though, was a renewal on our blog hosting—three more years that these travels will be available for all takers. Hopefully, our investment in time, bandwidth and web hosting have inspired a few more people to do some extraordinary travel; at the very least, its made the grandparents feel better! ← Milou is for sale! Yes, at least one St. Paul-based grandparent has felt better… Thank you! It’s also allowed your neighbors to live vicariously, so the blog has totally been worth it! We’re always happy when you update and we get to see your gorgeous photos and learn about new places. Sorry I missed saying that. It’s a miserable weekend, week, month in Madison so I am enjoying seeing your blog with its beautiful photos of warm weather, blue skies, and crystal clear water. What a trip of a lifetime your family is having. My son dreams of doing the same. Enjoy! Francesca do you remember me from 3rd grade?!!! Ann, fantastic teachers live in the minds of their students forever; F is always going to remember you! Hope you make it through mud season unscathed. I hope to hear about this great adventure in person when you return! Hey Ann! I was just replying to Deb’s latest post and noticed your name – not too many of us Conroy’s around (my single name prior to marriage) born in from England with Irish heritage, now living in Panama, Central America. We “crewed” with Sailing Milou through the Panama Canal last year, and have followed their cruising ever since.